It is a delight to be able to swim rain or shine, and on a still day sliding back the sections creates a whole new space to relax in. We needed to be able to use our pool in the colder months to help with arthritis and the enclosure means we can use the pool for up to 11 months of the year. It reduces leaf litter and pine needles to almost zero, saving a lot of time in terms of cleaning the water. Pool chemicals are kept stable with the pool being undercover. In summer there is very little need to heat the pool with water temperature in low-mid 30s without using heating and the air temperature in the high 30s we swim with the doors open and a cool breeze coming through. You’d think you were living in the tropics! 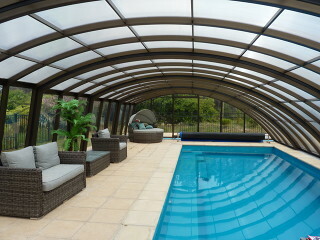 With the ease of use and low maintenance that the enclosure provides swimming is a regular and relaxing activity. Many thanks to Roland and Wendy who were great to deal with, helpful and friendly.